1980 Prevost LeMirage 40' converted in 2004. Presently located in Granfield, Oklahoma ((about 30 minutes north of Wichta Falls, Texas). It sleeps 7 tall adults. It has 4 bunk beds, 1 single bed which doubled as a couch, and a pull-out double bed. We lived in this bus full-time for two years as we traveled the west and central states. It is designed to be nice, comfortable, and efficient for inexpensive travel, and for spending extended periods of time around lakes and other remote areas that have no electricity or water or sewer service. 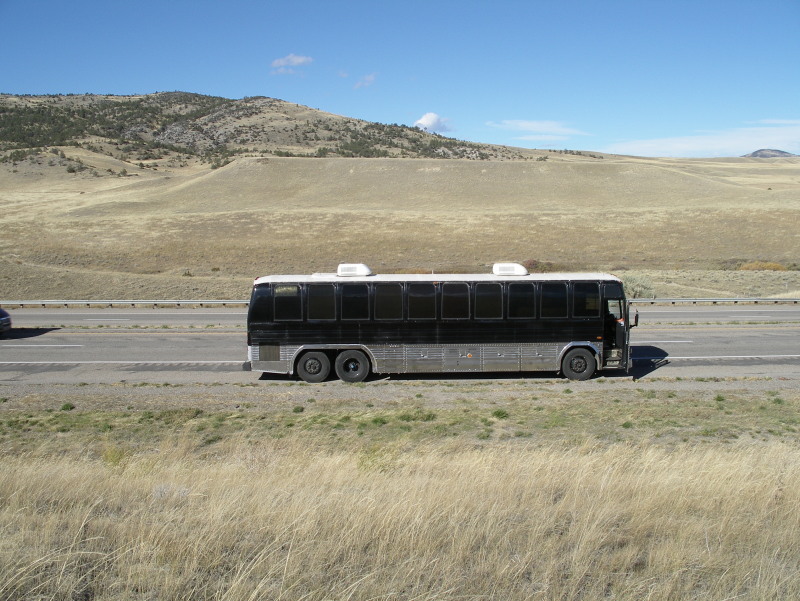 Except when it was extremely hot or extremely cold, we seldom parked in RV parks, as this bus is totally self-contained and can generally park where it doesn't cost. There is not another bus like this one anywhere. It is solid and very practical. The design of the conversion was very carefully thought out. It is not a luxury bus conversion, but it has some very important features that most of the luxury buses don't have. And it doesn't cost even close to the $500,000.00 to $1,000,000.00 needed to buy one of the new Prevost bus conversions. Most people do not know what to look for in a bus, so I'm going to tell you what to look for, so that you can see what this bus offers and what it doesn't offer. We looked at bus conversions for a long time before deciding that what we needed was not available. If we wanted it, we would have to convert a bus ourselves. What did we want? We wanted to see the USA together as a family. We did not want to stay in motel rooms. We wanted to be able to stay for extended periods of time in national parks or around remote lakes where utilities were not available. Why? Because that is where the beauty of nature can be found. We wanted to avoid having to stay in RV parks---to us, RV parks are no fun. We wanted our operating expenses to be as minimal as possible. We did not want a school bus, as they are generally slower and not nearly as sturdy as our needs required. Also, school buses generally make very inferior conversions. For one thing, the entrance door on a school bus is not secure and does not keep out the cold. Also, they tend to look rather junky, compared to the over-the-road buses, and they have less room inside due to long engine hood. We wanted a flat floored over-the-road, Greyhound type bus. Not all over-the-road buses have a flat floor, so you have to watch out. Many of the over-the-road buses have a deep path down the center of the bus, and the rest of the floor on each side of that path is a foot or so higher than that path. Such buses do not make for convenient living. Our bus is a Prevost. Prevost buses are considered the top of the line for bus conversions. One of the reasons for this is bacause they have a flat floor. They are also very sturdily constructed. They are made to last multiplied hundreds of thousands of miles in daily, commercial, intercity use. With our need for several beds we parted company with 90% of the commercial conversions. Most commercial conversions are designed for a couple (only two people), and have only one bed---they have one double bed in the back, and that is it. We used hand-picked, high grade, 3/4" plywood to divide our bus into rooms: a room with a double bed for my wife and myself, and two bedrooms with five bunks for our adult size children. What few bus conversions we have seen that had beds for more than one couple, had beds far too short for our six foot tall boys. We made our beds plenty long using square steel tubing (welded), and 3/4" plywood tops which we finished with multiple coats of polyurethane. The advantage of traveling and sleeping in a bus---instead of traveling in a car, and sleeping in motel rooms---is that you don't have to be repeatedly packing and unpacking suitcases, you can take more clothes with you, you can take more things with you, you get to sleep in your own bed each night, you do not have to worry about being exposed to other people's germs, you can pull into rest area or truck stop and take a nap anytime you want, and you don't have to worry that all the motel rooms might already be occupied when you arrive. But for all these advantages to be yours, you need lots of storage space, and this bus has it. We converted the original bus bathroom into a large clothes closet. The bus toilet is still there, but we thoroughly cleaned it, and did not use it. Also in the back bedroom, the rear of the bus over the engine has been converted into a large clothes closet. Also, there is a clothes closet in the bathroom. Most people start converting a bus by tearing out the overhead storage space! To us that is folly. Our Prevost bus came with, attractive, roomy, sturdy, yet light-weight overhead storage racks for almost the whole length of the bus. We left them in, and stored clothing, and all kinds of other articles in those racks. We also designed a huge amount of storage space under the beds. This space was extremely useful during our travels. We carried with us in the front outside bay an inflatible boat, and other camping articles. No, those things are not included with the bus! But that whole front bay is free for such use, or for any other use. The second bay is also free except for the space used by the three 40 lb. LPG tanks. This is a LOT of storage space! Diesel engines can go for several hundred thousand miles if well maintained. Our bus has only 94,000 miles (approximately) on a well maintained remanufactured 8V71 Detroit diesel engine. It uses very little oil. We changed the oil often all the time we used it, and fixed every ingine part that broke. When looking at a bus, check the miter box which turns the engine cooling fan (radiator fan), as it is often worn out on older buses, and that part is expensive. The miter box on our bus is almost brand new. Also, are the fuel injectors clean? We added injector lubrication-cleaner almost every time we filled the tank with diesel, so the injectors should be spotlessly clean. Do you want to manually shift the transmission on a 40 foot bus? Not if you are smart you don't. It is hard enough to drive a 40 foot bus, without having to shift gears. Our bus has an automatic Allison transmission which has given us absolutely no trouble. It has not leaked any transmission fluid all the time we have used it. Our bus has a 135 gal. diesel tank. On very flat land we got up to 12 MPG. In really mountianous areas it was more like 6 MPG. So, if you filled up completely, and drove until you ran out of diesel, the range would be from 810 to 1620 miles. But you NEVER want to chance running out of fuel with a diesel engine, for if you do it will be expensive and time consuming getting the engine to start again. So, it is best to fill up every 500 to 600 miles. We tried to never let the tank get below 1/4 full. Brake pads are not cheap for a bus, and it takes a lot of work to change them. Before you buy a bus, climb under it and look at the break pads. On our bus, you will see that the pads are still thick. While under the bus, check the air bags. Air bags are very expensive items, and on many older buses they are in very bad condition. Our bus has less than 3000 miles on 5 brand new air bags, so this is one expense you should not have to worry about. Another expensive item you should consider is the starting batteries. Our bus has been driven less than 3000 since we replaced the starting batteries. Tires on our bus vary in condition, but average about 70 percent of tread left. The best tires are on the front wheels. We do not know how many miles are on the coach itself. We put a used hubometer reading 120,623.1 miles on the coach after we bought it. The hubometer now reads 146,605.2 miles (as of June 2, 2008). Before we bought the coach it was used for many years by the Oklahoma City girls softball team, being used only during softball season. So, it sat unused for most of those years. Therefore, it is definately in much better condition than most coaches the same age. This is another area that sets our bus conversion apart from most others. Most luxury buses have water-cooled diesel gen sets that run constantly to supply electricity for the bus. That is nice for rock stars or other celebrities, who are generally given parking spots where noise is not a problem. But for most people this is a big disadvantage. Most parks will not allow you to run a diesel (or gas) generator at night, because it disturbs people who want to sleep. As for us, when we parked our bus, we definately did not want the noise and vibration of a diesel engine running---we wanted peace and quiet so we could relax. But we also wanted lights and electricity to run our computers. So, we installed: six (6) house batteries, a 1750 watt Xantrex X-Power inverter, a Vanner battery equalizer, and a 35 amp. battery charger. What this means is that we usually do not have to use the generator, as the house batteries are recharged by the huge bus alternator (via the Vanner battery equalizer) as we drive down the road. And when we are able to plug in to a land line, the house batteries are recharged via the 45 amp. battery charger. This furthermore means that we can boon dock by a remote lake or any place without electricity, water, or sewer hookups for one or two days without running the generator at all. For extended boon docking, the generator can be run a few hours each day to recharge the batteries. The bus has a 5000 watt gasoline powered generator with the exhaust piped safely through an external muffler. This generator needs repair. The gasoline engine runs fine, but the generator is presently producing only one phase, and I haven't had time to fix it. Our bus has a 100 gal. fresh water tank, and a 100 gal. black water tank. It also has a long dump hose so that it is easier to dump. This is another item to ask about. Many bus conversion have small, cheap water pumps that provide almost no water pressure at all. Such pumps may have to be manually turned on and off. Our bus has a SureFlow SmartSensor 5.7 gal/min. water pump which automatically turns on and off as needed, and gives excellent water pressure. This is another item to ask about. Most bus conversion have ordinary pvc pipe for the plumbing system. Our bus has freeze-proof pipes. Think about that for a little bit, and you will realize the great advantage of this. This bus not a new, half-million dollar status symbol on wheels, but it is not just a cheap piece of junk either. It is made to be as practical and maintainance free as possible. I did not want to constantly have to be fixing things, so the the very best of our ability we always used the more durable parts available. The shower is small, but nice and efficient. One of us could and often did shower as anoter of us drove the bus down the road, as the pump is power by the house batteries. We even had hot water with such showers, as the water heater is powered by propane! Beside the shower and a clothes closet, the bathroom also contains a small sink, and a Thetford RV toilet. This is something else to watch out for. Many conversion use a standard toilet for a house. This looks really nice, and impresses people who have never traveled in a RV. The fact is a regular house toilet, no matter how lux it may be, is a very big liability in an RV of any kind. Why? Because it uses way too much water! Each dump depletes your fresh water supply of several gallons of water, and add several gallons of water to your holding tank. A Thetford RV toilet like our bus has uses only a quart or less per flush. How do you want to spend your vacation? constantly filling and dumping your tanks? or relaxing and enjoying the beauty of the outdoors? This is another item you need to enquire about. Will the hot water heater work only if plugged into a land line? Will it work only with LPG? If it will only work when plugged into a land line, then you will not have hot water when parked at a lake somewhere far away from electricity, unless you want to start up a generator every time someone needs to take a bath. If it will only run on LPG, then it will be using up LPG even when you are parked in an RV park and are going to be paying so much for electricity whether you use it or not. Also, how many gallons does it hold? Nothing is quite as frustrating as running out of hot water on a cold night because the hot water heater only holds 3 gallons. Our bus has a 5 gal. propane/110 volt hot water heater. When we are plugged in to a land line we heat our water with electricity to save propane. When in the boon docks we heat with propane. We never ran out of hot water. This is another area where our bus stands head and shoulders above most other RV's or bus conversions. Many RV's and bus conversions have a large fuel tank that is built into the vehicle itself. This can pose big problems. Often such vehicles cannot get close enough to the filling tanks for the hoses to reach. Many other RV's have only 2 small tanks hold a total of 40 lbs. of propane. This is not sufficient for extended boon docking. If you run out of propane on a cold night far from a station selling propane, your vacation will probably be ruined. If you are traveling in an area new to you, it may take many hours to find propane. Our bus has three 40 lbs LPG tanks for a total of 120 lbs of propane. In our two years of travel, we were never even close to running out, even though we often drove many hundreds of miles before running across a station selling propane. Many RV's have very inefficient heaters that rapidly use up propane. If they have a fan they also rapidly use up electricity. The use of electricity may not be that significant when you can plug into a land line, but when parked by a remote lake far from A/C electricity, it can rapidly end your stay there. Also, the fans in such heaters are noisy. Our bus has a Suburban NT-40 forced air propane heater. This particular heater was not cheap, but it has the very problem mentioned above. It rapidly depletes our propane and depletes the electricity from our house batteries. We did not like this, so we installed one Olympia Wave 6 catalytic safety propane heater in the front of our bus, and one Olympia Wave 3 catalytic safety propane heater in the back bedroom. These Olympia heaters are extremely efficient and are totally silent and don't drain the house batteries at all since they have no fans. When we are plugged into a land line we use two small ceramic heaters (about 6"x6"x6" cubes, not included with the bus, but inexpensive to buy) to save our propane. The Suburban heater is still in the bus, and still works fine, but we have never used it since installing the Olympia heaters. Even during very cold (down into the 20's), snowy weather up by the Canadian border during the start of winter, we were warm and cozy. However, if it got down below zero it might be a different story. We don't know, as it never got that cold during our two years of travel, as we traveled to the south during the winter. Air conditioners are something else to consider when looking for a bus. Many people remove the original air conditioner that comes with their bus when they begin converting it. That is a very big mistake, for that big air conditioner fan motor also powers the heater! Also, you do not want to have to run a diesel generator to power air conditioners as you drive down the road. The original bus air conditioner can do a much more efficient job. But you must realize that there is a lot of air to cool in a 40 foot bus. It is going to take some time on a hot day for the inside of the bus to cool down. The original bus air conditioning in our bus works and has been converted to use legal coolant. Also, we replaced worn out parts in the huge fan motor and it now works great. The coolant may need to be checked now, as the bus has been seldom used for the last two years. Summer is about over, so this is not much to be concerned about until next summer, but there is one thing about our bus that I would change before next summer if I were buying it. And that is the paint. Black paint more than any other color absorbs heat. The very best way to keep the bus cool is to cover the black paint between the stainless steel lower side panels and the roof white. White reflects heat. Most people do not realize just how much difference there is between these two colors when it come to heat absorbsion. We have already painted the roof white, and that helped a lot. But if all the black paint was covered with white, the bus would be much easier to keep cool. Of course, with Fall approaching, you won't need to be concerned about that until next Summer. We installed two Coleman Mach rooftop air conditioners. They do a very good job when we can plug into land line electricity. A note of caution: The roof-top air conditioners cannot be used while driving down the road. You must NOT run the gas generator with the bay door closed. That would be extremely dangerous. The generator would overheat and could explode. However, when parked with the generator bay door open, the generator can be used to power the two roof top air conditioners with no problem. No matter how rich you are you can only have a certain amount of space in a bus---even if the bus is 40 feet long. So you have to decide the best use of the available space for your particular needs. We designed the space behind the driver's seat to be used as either a kitchen or office. There is a LPG gas valve directly under this area to be used for installing a gas stove and gas refrigerator. However, after thinking about it, we decided that we did not want our bus to smell of cooking odors, and we did not want to have to wash dishes in the bus. When on the road, the only clean water you have is what you can carry in your fresh water tank; so you need to use it wisely. Remember that every gallon you use goes into your holding tank. And the sooner your holding tank fills up, the sooner you have to dump---not the most pleasant task in the world. And you can't dump unless there is a place to dump. So, there is a price to pay when you wash dishes 3 times a day in your bus. We decided to just eat out while on the road, and for us that turned out to be a very good decision. No time wasted preparing food. No cooking odors in the bus. No dishes to wash. And no trash to throw away. Trash is not a minor issue when traveling. Sometimes it is extremely difficult finding someone who will let you use their dumpster. When we spent a few days in a park, it was different. We bought groceries, and used the grills found in almost all parks to cook our food. This was much more fun than cooking in a bus. And most parks also have fresh water to wash your dishes with, and dumpsters so you can throw away your trash. The space that would have been taken up by a kitchen we used instead for an office. I like more power than a laptop computer generally offers, so I stablized my desktop computer by screwing it to the floor, and used it to write a book during the two years we were on the road. Thus, we both had more fun and were more productive than we would have been with a kitchen. Also, would you really want a used stove and used refrigerator? It would be a simple matter to install a new set in this bus, provided you have any handyman skills at all. This bus did not smell of smoke when we got it, and has never been smoked in since we have owned it. Nor has any food been fried in it. Something else this bus has that few others have is an air hose. It can be used to air up a low tire, or to blow dermis out of the bays, or clean parts. It is long enough to reach any tire on the bus. The back room has an 8' long fold down desktop where our teenage boys did their school work. The bus has a Nextel cell phone antennna. The drivers side windshield is new. The front bumper is slightly bent on the passenger side (easily replaced); passenger side windshield wiper works, but needs repair; turn signal switch must be held down when turning left, so needs repair. WiFi antenna recently hit a tree limb and broke off, and we have not replaced it; all that is needed is to screw a new antenna onto the base. As previously stated, the generator engine works fine, but the generator itself is generating only one phase of electricity. I don't think this would cost much to fix, but I haven't had time to fix it. This is an excellent bus conversion for a family with children, or for hunters or campers who spend extended time in areas where there is no land line electricity or other utilities, or for anyone needing beds for up to 7 tall adults. It is not a luxury vehicle, but it is a neat, respectable, economical (for a bus) house on wheel. We found it very comfortable, and we extremely enjoyed living in it for the two years of our travels. We will always have fond memories of those wonderful two years. We really hate to sell this bus, because we know we will never be able to find another one like it. But our present situation no longer affords us opportunity to use it. We hope that you will enjoy it as much as we have. This is a heavy duty vehicle which has been well maintained. We would not be afraid to drive it anywhere. However, the bus is being sold as is without any guarantees of any kind. After all, the price is very reasonable. PHONE: (940) 232-6088. Ask for Samuel. Click here to see more photographs of this bus converted to a motorhome.